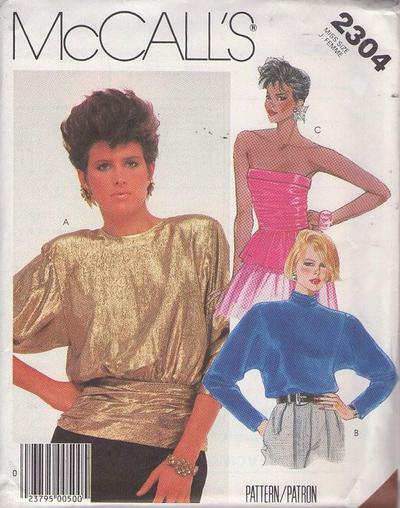 1985, 80s Disco, Retro Party Clothing Patterns - MISSES' TOP AND BUSTIER: Blouson pullover top A, with long, tapered sleeves, has round neckline with back neck opening, shoulder pads, gathered, faced bias hip band with hook and eye left side placket closure. Pullover top B has shoulder pads, back neck opening, faced bias collar with back gathers and back opening, and long tapered sleeves. Bustier C, cut bias, is gathered to stay (underbodice), has bias upper band, boning in side seams, gathered peplum (straight grain) and left side placket closure with hooks and eyes.